Make a Man(iple) out of You. So I picked this stuff up from the sorting office this morning and have a Warlord on the way. Personally, I blame the good people of the Adeptus Titanicus sub forum. As I'm writing this, the postman turned up with my Warlord. I got a pretty good deal on this Titan from a guy online. As you can tell, he's built half of it already, although there's enough play in the joins to tweak the angles of the pose slightly. I'll probably replace the white bricks he's standing on. It's a bit of a shame that the armour plates are glued as that will make painting the skeleton a bit awkward, but I suppose beggars can't be choosers. I'm not too sure how I'm going to theme the bases. Any suggestions? Never mind the bases, what Legio? As I said before, I've been thinking of God Breakers and have done up a test piece to see how I like the colours. However, having seen the instruction booklet, I'm a little tempted by Legio Astorum, for two reasons. 1) It ties in nicely to my Avatar image. 2) Perhaps more pragmatically, I have an excess of blue paint due to buying multiple copies of Conquest Issue 1. Currently none of the guys I game with play AT, so I might end up collecting two forces down the line. We'll see. Does anyone have any good resources/generators for cool titan names? I've decided to call my Warlord Tertio Aestus, (which hopefully translates as Third Tide), but am undecided on the other titans. I'm considering continuing the semi nautical theme, but am open to suggestions. Use the Google English to Latin translator and go wild, that’s what I did. Edited by Achinadav, 27 October 2018 - 01:47 PM. Well, as long as you’re confident you’ll tackle the yellow... I was hoping for another Krytos Princeps but pragmatism trumps everything! Good luck with your project, I’ll be following it closely! I like the idea of a semi-nautical theme (and scheme) - and to go with such a brilliant thread title... looking forward to what comes next! I'm guessing they got bored/needed the money. Their loss was my gain. Got the whole thing for £40 posted. Definitely something I'll look into. I was putting some of the song lyrics into Google Translate as a bit of a private joke. The usual suspects (raging fire, great typhoon etc) didn't look great, but "rage of war" comes out as Ira Belli which isn't awful as a Titan name. I might keep going and see what I come up with. Tenebris luna is another option. I spent today putting together the buildings. I'll get some photos up. I like that you can stack them to change up the layout, but you can end up with weird scenarios like massive doors on the second story which breaks the immersion for me. Take a Dremel to the doors like the building has been shot up. I could destroy the doors, but if I leave a hole, you can see inside the hollow buildings which looks a bit naff. If I disguise the doors, whenever it's a stand alone building, I've made an inaccessible cube with windows. The simplest thing is probably be mindful of which buildings I stack, only stacking buildings on larger buildings, so the doors open onto a balcony as opposed to empty space. You can also combine stacking smaller footprint modules on larger ones, then you have some roofs on which the doors open. On one I made I added small balconies (no railings yet). Don't hesitate to have some modules with no doors. They are the obvious choices for stacking higher and if left on the ground they could be accessible via an unseen underground entrance. Nice project you started. Have fun with the songs and the latin translator. Edited by Mendi Warrior, 27 October 2018 - 08:45 PM. Thanks for the suggestions Mendi, your suggestion sounds like a good call. I'm starting to think you lot are a bad influence. Here was I planning to dip a toe in by getting a single Warlord to see how I got on with him and now I'm thinking about getting a Grand Master Edition to go along with what I've already got. You know the absolute worst part about that plan? I still can't make a Maniple out of three Warlords, two Warhounds and six knights. Well, you just need to add a single reaver and you can make all 3 maniples. And it seems we can expect 5 other types of maniples when they eventually release the Beta-Garmon campaign. Just dipping a toe? A great mind once said "Do. Or do not. There is no try." There are more maniple combos coming out, the solution is to buy lots of all of them! Yesterday and this morning, I was working on making a battlefield for AT. A while back I picked up a preowned Realm of Battle board, which I'm planning to use for AT (and the occasional game of Lord of the Rings). To this end, there are a few changes I need to make for it to be of a suitable scale for these two systems. Primarily, the skulls need to go. The massive skull pool definitely needs to go. I'll hopefully keep you updated on the board's progress as it happens. I want to have a themed terrain set for AT. I'm still musing on what the actual theme is going to be, but I thought adding some trees wouldn't hurt. These are fairly cheap to make. I bought a pile of trees for LotR back in the day, so I superglued the smallest ones to some wooden bases I picked up from a craft shop and slapped on some cheap filler (I got it for the princely sum of £1 and so long as you don't let it dry out, it'll do all the bases you ever need). I also assembled the building sprues. I've kept them all single story, but they can be stacked (as shown). Here you can see the trees once the filler has been added. The plan is to paint these bases to match the board colour and add a dry brush to make them pop. Hopefully once they're the same colour as the rest of the board, they'll blend in a lot better. I've been having problems with the trees "shedding" though a friend has recommended coating them with watered down PVA through a spray bottle, which should help. The boards were painted when I got them, so I'm in two minds as to whether I'm going to leave them or repaint them. 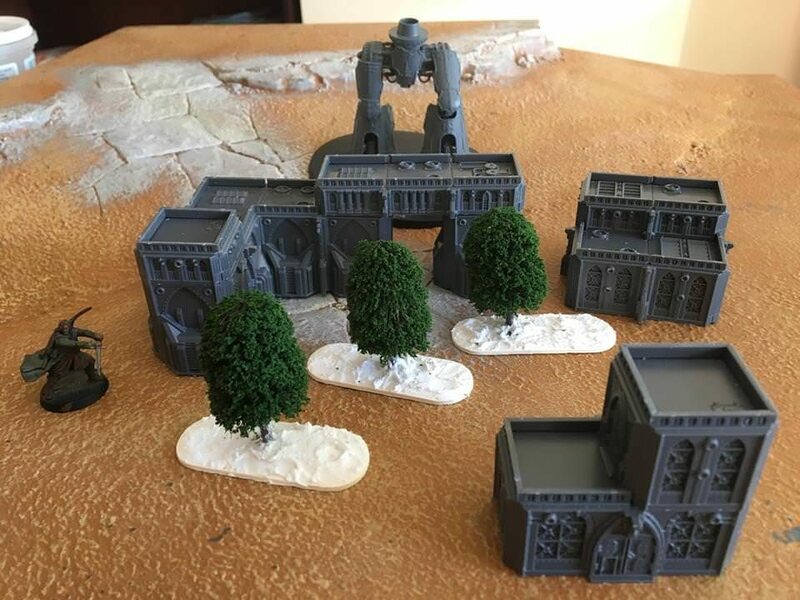 One thing I was keen for was that I'd be able to use the trees both for Adeptus Titanicus and games of Lord of the Rings. Here, Aragorn and the lower half of Tertio Aestus are on scale duty. I think it works ok.
One thing I like about the Realm of Battle board is that the built in hill provides some built in cover, obscuring smaller titans and if you put some terrain on the crest of the hill, small buildings can even cover Warlords. I haven't played yet, but from watching battle reports, it looks like games are much more tactical when they aren't played on Planet Bowling Ball Alley. Has this been peoples' experience? How much terrain do you need for a fun, balanced game? I get the feeling Warlords don't appreciate a sprawl of small buildings for Warhounds to hide in. Still undecided on the Legio, so feel free to make suggestions and perhaps more importantly, the reason for your suggestion(s). I'm all ears. With regards to the skulls, I would consider using magnets so they can be covered by amovible parts (e.g. a forest, a hill, …). That way if you want to revert to a board with skulls you just need to remove the amovible parts. The universe is big, so giant trees are not out of place. Giant when seen in the context of AT, normal ones in the context of LotR. Hence I would not hesitate to include some taller ones too. Thanks Mendi. I can't see any scenario where I miss the giant skull pile. The current plan is make it into a pond/lake as that scales pretty well. I just need to find a cheap resin that I like. I've tried the pound shop stuff, but I haven't really been convinced. I'll probably give it another go. It's possible that I just haven't being mixing it properly. With regards to the trees, in real life, they can be absolutely massive, dwarfing huge buildings. However, that doesn't always translate well onto the tabletop. I'll have a play about with some of the larger ones to see what Iooks good. I like urban environments so I made a lot of paper and styrofoam buildings - I can’t post pics on mobile so I’ll post later what we did today. The current plan is make it into a pond/lake as that scales pretty well. I really like this idea actually: I think having the skulls underneath an occluded surface would be very cool! Fajita Fan, are the pictures on your thread somewhere? I'd be interested to see your suggestions. I think think that skull ponds certainly have their place, but I don't think they mesh with the style I'm going for. 28mm scale skulls are out of scale for both LotR and Titanicus. I have used filler to cover over the skulls and painted it brown. I'm going to use the smaller of the two piles as a test bed for the resin I've got. If it doesn't go on clear, it can represent a swamp instead of a pond. 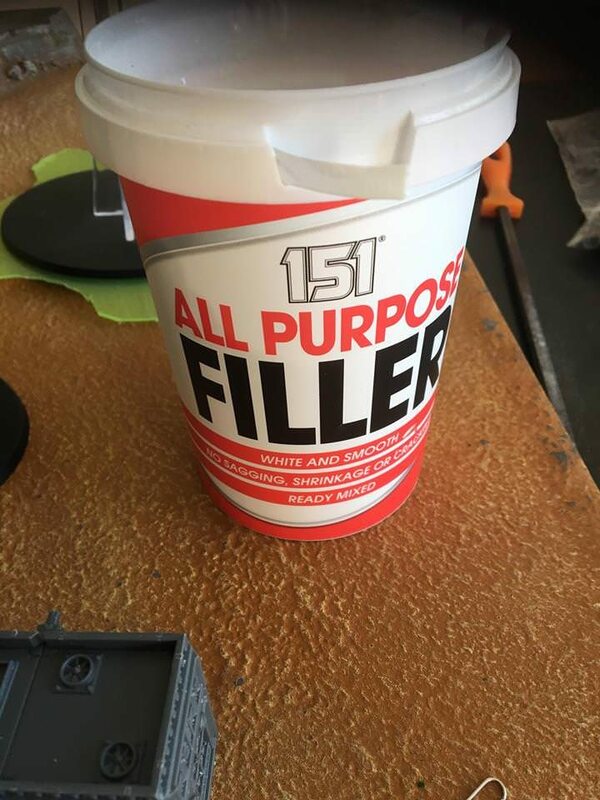 Worst case scenario,I cover over it with more filler and texture it with sand. Beyond that, I haven't managed to get much done by way of hobbying, though I have sold off and boxed up some models I won't ever get around to using. I think I'll save up for more AT stuff down the line. It's currently a toss up between the upcoming Black Book or the hopefully re-release of the Grand Master Edition. Potentially both if I get my finger out and paint some stuff. Hoping to get some hobby time in later this week. Edited by Fajita Fan, 29 October 2018 - 10:18 PM. We'll see. I find I'm guilty of starting projects I don't finish, so please d feel free to hold me accountable to my goal of fully painting at least one Maniple of Titans. Hoping to get a bit of free time tomorrow evening to get some hobby stuff done. As mentioned, I got a bit of hobby time tonight. Things are progressing fairly slowly as I'm trying to do this project properly. 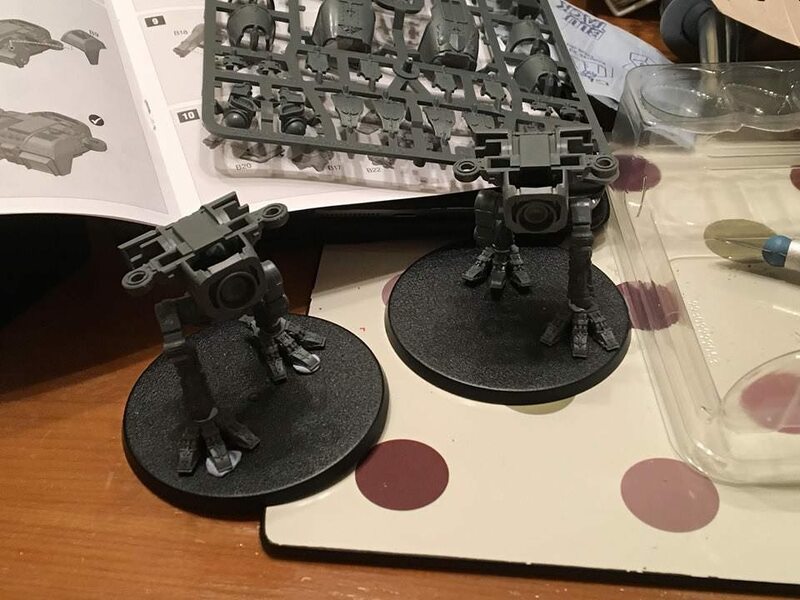 I've spent tonight cleaning mold lines and have assembled the skeletons of the two warhounds. Here's what I've achieved tonight. It's a small step in the right direction, but as a wise man once said, do not despise the small things. I'm keeping the carapace separate to spray them grey on the sprue. The skeletons will likely be painted with black by hand, then start with an all over coat of Leadbelcher. With regards to names, I'm probably going to stick to the semi-nautical theme. I'm thinking Charon (the ferryman), though his mates name is still to be decided. 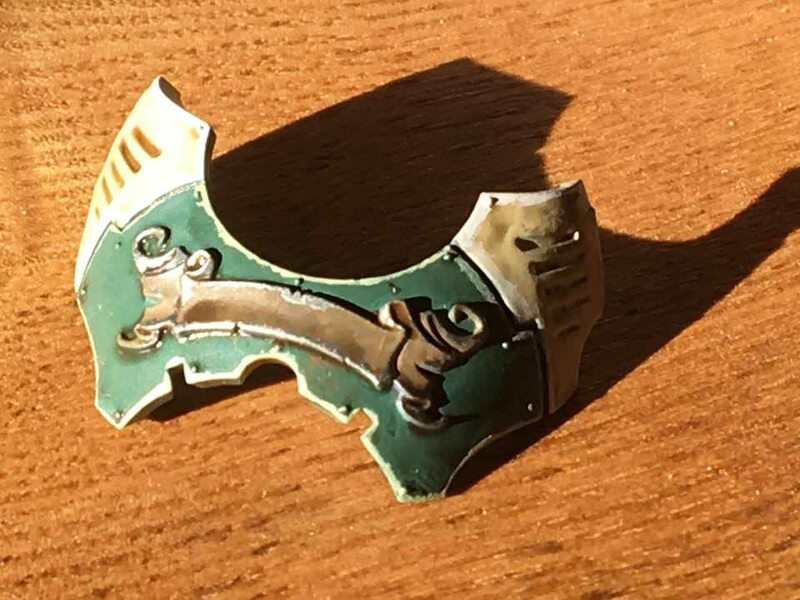 Regarding magnets, what do folks use for the Warhound's weapons? I've got a pile of 1mm round magnets, but I feel I'd probably be better investing in 2mm round magnets. I used 1/8x1/32 N42 magnets which are super strong. The nice thing was they're small enough to fit in the bowl of the weapon socket without greestuff behind it and they're strong enough that you can actually aim the gun up and down but they won't fall out. My Warhounds aren't just magnetized but poseable. *Edit: Thread title here is underrated. Edited by Fajita Fan, 01 November 2018 - 10:35 PM.